This project is an office building that models the intersection of universal and green design on an infill site in the River North neighborhood of Chicago. Working with consumer groups and staff, LCM architects and Access Living developed universal design goals for the building, then methodically worked through each decision, testing them against the universal design goals and the criteria for a silver LEED rating. The result is an “ordinary” looking building that exemplifies social, economic and environmental sustainability. Access Living is a not-for-profit service and advocacy organization founded in 1980 to improve the lives of people with disabilities. In keeping with its mission to serve a diverse community from all over “Chicagoland,” Access Living selected a centrally located urban site, well served by public transportation. The new headquarters is a model of social and environmental sustainability, with a gold LEED rating, that demonstrates the intersection of green and universal design. The building is a 35,000 square foot four-story office building, on an 80 by 140 foot site, that also serves as a community resource and educational center. The neighborhood is a mix of residential and commercial uses in easy walking distance to restaurants and retail. Nearby are two lines of the Chicago “El” as well as bus service. There is staff and visitor parking on site, under the building and on grade at the rear of the ground floor. One enters into a reception lobby-lounge and consumer resource center, both of which are visible and accessible from the street. The building core of elevators, stairs, restrooms, and support spaces occurs along the east wall of the building. This zone borders a “Main Street” corridor that runs from the front to the back of the building and benefits from daylighting at each end. The balance of each floor is available for all other functions: open plan office for each or the organizational teams, private offices for the senior management, one large meeting room and two smaller ones, employee lounge, reception and exhibition hall, roof terrace, and assorted support spaces. Image of the front of the building showing pedestrian and auto entrance, height and width and material of the building. Shows the sliding front doors to the building that allow all users to enter with a minimum of effort. View from second floor to two story entrance atrium with seating at the front windows of building. Image of a standard work station; features easily configurable partitions and layout options. The night time view shows the quantity of windows that let in natural light during the day. A user at a computer table in the resource center. The table height can be easily adjusted to suit different user needs. Different types and places to sit to suit different needs and abilities. Daylight rooms with automatic shade/light sensors and pedestal tables. Main corridor is wide enough for socializing or for many chair users to pass by one another easily. Doors and controls at each end of the elevator make it easy to enter and exit the elevator without disturbing other passengers. It speeds up the use and avoids awkward maneuvering. Windows to the corridors allows previewing and sends light to interior spaces. Care teams with central workspace and generous cubicle space with adjustable tables and cabinets. To initiate the design process, Access Living and LCM Architects organized a design symposium that brought together experts in universal design and a representative group of users. The session was organized to learn about barriers and brainstorm solutions for a typical office environment. The session provided the architects with a wealth of information as well as guidance for further investigation. From this exercise, the architects developed a set of goals for universal design and for an advanced LEED rating. They embarked on a process of examining every aspect of the building and its furnishings to meet those goals. Although the intent was to create an office environment that would resemble any typical office environment, the expectation was that it would be superior in usability and human comfort because no decision would be taken without deliberation of its impact on a wide range of users, many of whom have disabilities. The features of the building that capitalize on the intersection of green and universal design are those that save energy and enhance user experience often because they include some aspect or mode of operation that is tailored to individual needs. Automatic sensors to open the front doors, turn off lights in unoccupied spaces, raise and lower shades and operate faucets and toilets are energy saving and work well for people with limited strength, dexterity or fine motor skills. Abundant daylighting, flexible task lighting and zoned ambient lighting allow individuals to have the best lighting for vision, and the electrical energy use to be minimized. Local overrides for HVAC and light and shade controls allow for more responsive energy use and a higher degree of human variation in comfort. Non-emitting paint, fabrics and carpets affixed with water based glues reduce the need for air filtration in the HVAC system and increases the comfort and productivity of users with allergies and chemical sensitivities. At least two innovative design aspects were incorporated to accommodate the large number of staff persons who use wheelchairs and other mobility devices. There are two elevators that are large enough for four wheelchair users at any one time. To allow someone to enter and exit the elevator without taking time and space to turn 180 degrees, there are doors and controls at either end of the cab. There is no need for standing occupants to step out to make room for a chair user to exit or for a person using a chair to maneuver out backwards. An equally innovative solution is the design of the restroom entrances without doors that are cumbersome for many users. The layout is typically seen in airports with a U turn around a privacy screen wall. Care has been taken to provide acoustical treatments including high NRC ceiling tiles and more sound absorbing materials to reduce the effects here, and throughout the building, of ambient noise that can be distracting to some and a barrier to hearing for others. Access Living documented the design intent of the project starting shortly after the design symposium in 2004. The original list created by LCM Architects was augmented and analysed to maintain a record of the project. In 2008, approximately 18 months after the building was occupied, a Post Occupancy Evaluation was performed. From the evaluation, users are highly satisfied with the way the building looks and the way the building works. The clarity and simplicity of its spatial oganization makes it easy for first time users to navigate. The elevator is visible from the front entrance; the 1st - 2nd floor atrium, and the glass walled conference rooms on the 3rd and 4th floors provide ready landmarks on the main street corridor and when exiting the elevator. Finer grain wayfinding to specific workstations in the open plan offices, especially for those with vision impairments, is more difficult. Particular details called out positively include the quantity and flexibility of light (natural and artificial), quality of the air, and the use of color and art. Most people appreciate the flexibility of the workstations. The work surfaces, cabinets and drawers, as well as the chairs, can be adjusted for people of different heights and preferences. The green roof and terrace are considered a tremendous asset. The unusual entry sequence to the toilet rooms received a generally favorable reaction, while the details of the stalls and the automatic sensors received a much more mixed review. The stall doors and latches are cumbersome according to some; the sensors too erratic and stingy according to others. The large elevators with dual controls are appreciated by chair users and non-users alike. One person even remarked that they roominess allowed for spontaneous social interaction. In the same vein, people who may not benefit directly from some features - such as the wheelchair user friendly elevator or the resting room - take pride in working in a place that considers the need of a wide range of users. The post occupancy evaluation revealed that some fine grain adjustments are needed, the overall design intent and its realization are extremely sound. The quality of the environment for a large number of users with very particular environmental requirements is extremely good. 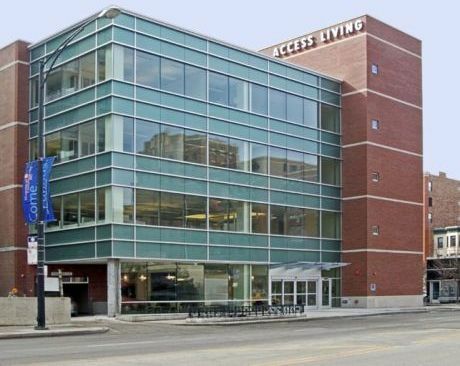 Access Living reached the goal of creating a beautiful and inviting office building that works for a wide range of users. Participatory design process with user experts. Doorless toilet room entrances; automatic sensors on fixtures and fittings. Sensors activate flushers, faucets, soap and towel dispensers in the toilet rooms for energy saving and sanitary reasons.